Currently, around 20 per cent of Chinese are Buddhists, contributing to it being one of the largest religions in China. As China becomes more popular, an emerging tourism - religious tourism, has gained popularity locally. 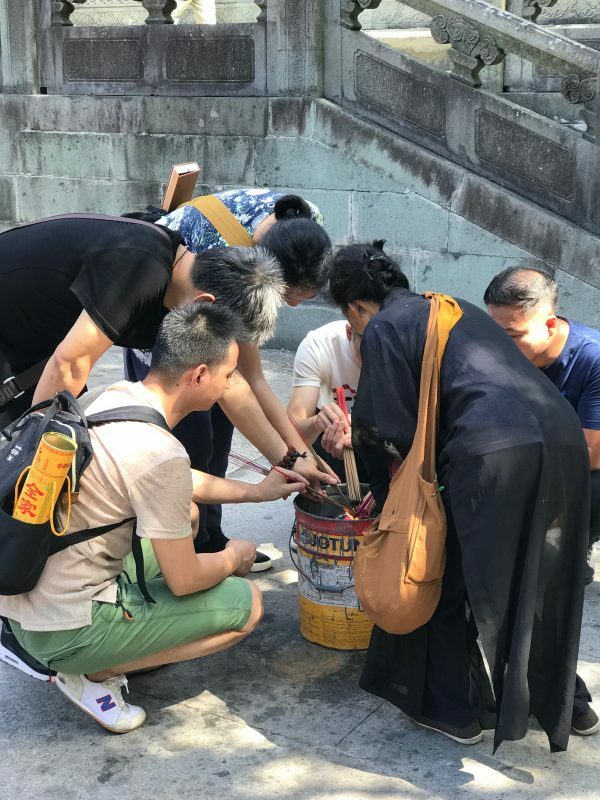 Last summer, I participated in a religious tour with my family and visited Mount Putuo. It is located in the Zhejiang province and is regarded as one of the Four Sacred Mountains of Buddhism. Buddhism is well-known as polytheistic. This Mount Putuo is particularly for paying tribute to Guanyin, also known as the Goddess of Mercy. To reach this specific island, we took a thirty minute ferry. The government once planned to build a cross-harbor bridge. However, the island resembled the the shape of a lotus flower. The construction of the bridge would not only destroy the outlook, but many Buddhist believed it would take away the spiritual fortune. The plan was called off at last. The highlight of a religious trip is that you could visit more than ten temples and pray to Gods within four days. Though the scale of temples varies from regions, the structures and rituals are more or less the same. Skanda is one of the protector deities of Buddhist law. Temple used to provide the monks with free accommodation, ranging from one to five days. Since it is embarrassing to ask for accommodation, the temple would signal the monks based on the height of the sword. The higher, the longer. Before we pay tribute to God, we would meet the four Heavenly Kings in the front door, representing a peaceful world. By holding broken musical instruments or weapons, it reminds the believers that nobody is perfect, even for God. At the back, the Buddha Maitreya reminds the believers to stay optimistic through his benevolent appearance. So how does the Buddhist pray to the Goddess of Mercy and Gautama Buddha located in the central temple? You have to offer at least three joss sticks and some tribute, namely candy and fruits. Then kneel down, meditate prayers, and nod your head with your hands facing forward. Remember palms should be facing upward as it represents holding the Buddha’s feet humbly. We could later spread good fortune with relatives and friends by sharing tributes. Travel is never satisfied without mouthwatering cuisine. We were served vegetarian food, since Buddhist uphold the belief that killing living creatures is sinful. It is not mandatory for Buddhists to be vegetarian. However, some still maintain the ritual, some for good health, while others do so in exchange for realising wishes. If you are a bit tired of visiting temples, Foding Mountain is another ideal option. It literally means “the peak of Buddha”. 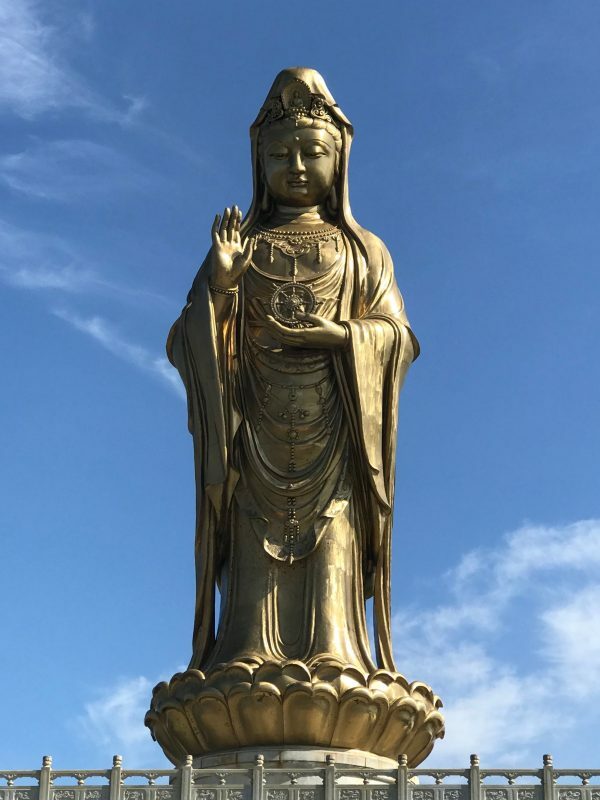 You can enjoy the sunset with the sea view and one of the largest golden statues of the Goddess of Mercy.The more you visit, the higher the chances the wishes come true. Once their wishes come true, believers will come back in the next year showing their gratitude. Perhaps this is how religious tourism operates in a sustainable way. Chinese New Year is in February this year. 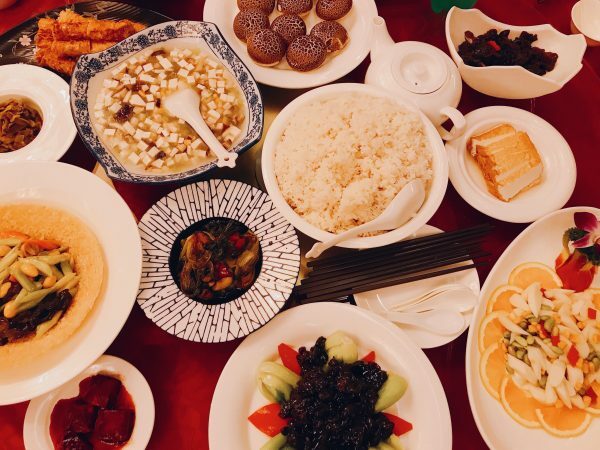 We preserve the rituals craving for health, fortune and luck, not only in festival, but also during travel. I am not a Buddhist personally. However, my trip was worthwhile in order to understand how Buddhism interprets the world and the symbolic stories behind specific rituals and taboos.